According to the audience and critics, his performances were often acclaimed as: “more than a touch of class.”, ” Angel on Guitar”. 2014 concert season included “Ramirez-Carisch Tour” at festivals such as “Andres Segovia” in Madrid, “Tertulia at Tienda Ramirez” in Spain, “Fiuggi Guitar Festival” in Italy and others, as well as appearances in “Porgy & Bess” in Vienna, masterclass and performance for “VAMÖ“organization in Austria and numerous recitals and outreach concerts in Europe. This young artist and guitarist has already performed in Vienna’s “Musikverein”, „Mozart’s House“, Castle Schonbrunn with Webern Symphonic Orchestra, Festival “Josephstadt”, St. Cyprian Church in London, the Festival “Guitar Days” in Zagreb, etc. In upcoming season 2015/2016 Ivan will perform at prestigious festivals such as Festival Della Valle Dell Orfento “Caramanico Therme” provincia de Pescara, Festival Internacional de Guitarra Girona – Costa Brava, Festival Internacional de Música “Ciudad de Linares”, Festival Internacional de Guitarra “Villa de Aranda” de Aranda de Duero, Conservatorio de Música “María Molina” de Úbeda, International Festival Bankgok (Thailand), Festival Magnitogork (Russia), Hermoupolis Guitar Festival ( Greece ), „Andres Segovia“ Festival in Linares (Spain) and other concerts in Europe, Asia and America. He has won first prizes at prestigious competitions such as certamen “Comarca el Condado” (Spain, 2015), “Andres Segovia” competition in Linares (Spain, 2014), “Hermoupolis Guitar Festival” in Syros (Greece, 2014), “Fiuggi Guitar Festival” in Fiuggi (Italy, 2014). “Peloponnese Guitar Festival (Greece 2016) and was awarded with highest prizes in competitions such as “Villa de Aranda” in Spain, “Vienna Guitar Competition” in Austria, “Enrico Mercatali” Guitar Competition in Italy, “Sinaia Festival” in Romania, “Guitar Art” festival in Serbia, “ÖJAB” music contest in Vienna and many others. In 2009 he was admitted in the program of the Yehudi Menuhin’s Foundation “Live Music Now” in Vienna and Cologne, where he held numerous concerts and recitals. The same year he was nominated for one of the most successful instrumentalist of the “selected soloists’ performance content at the Vienna University of Music and was awarded the prestigious prize of “Tokyo Foundation” and “Viktor Bunzl” Foundation. The 2012 season brought nearly one hundred concerts as part of “La Strada” concert series with violinists Illya Huliychuk and Kamile Kabiliute. Ivan Petricevic was born in 1987. Belgrade, former Yugoslavia. 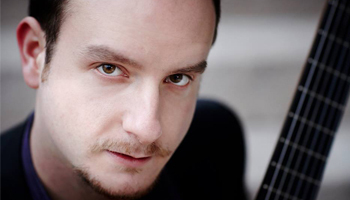 He studied in the class of Ante Cagalj at Conservatory of Music “Elly Basic” in Zagreb, Croatia and continued his studies with Alvaro Pierri, Walter Würdinger and Roberto Aussel at University of Music and Performing Arts in Vienna, Austria and at Hochschule für Musik und Tanz in Cologne, Germany.